Compare this trash with Psychic Scream that hits the entire board for just 1 more mana! This card isn't fun to use, it's far too expensive to be decent removal, and the removal still doesn't destroy it. i think whoever made this card should be fired for their glaring incompetence. People are finally using it! (cost 4) : Shuffle an enemy minion into your opponent's deck and opponent draw a card <= Mill Druid. This card is rare, lol. Entomb completely shits on this card. Recycle mana cost should be reduced. This card essentially says "Silence an enemy minion, then destroy it. Shuffle a copy into your opponent's deck." 6 mana is quite a bit for hard removal, but 6 mana hard removal is far from unplayable (see Siphon Soul). This even cleanly handles Sylvanas Windrunner, Tirion Fordring, and anything with Ancestral Spirit. So what makes this card so bad? I think the flaw with Recycle is that the traits of this card are pulled in opposite directions. If you target a strong minion, you're giving your opponent a good card for their 1/3 of a Gang Up. If you target a weak minion, you're not getting good value for your six mana investment. In theory, you could run this in a combo deck where you try to bring the game home in a matter of turns afterward, so that the chance of your opponent redrawing their threat is minimal. But then why are you using 6 mana on removal rather than setting up your finisher? I personally play this card, and even though it has it's downsides it goes along with the druid class. In terms of value, it is (sort of) an assassinate (5) with a silence (1-2) before hand to deal with Belchers, Sylvanas, Sneeds, Highmane, etc. The downside is much less severe than Naturalizeimo. 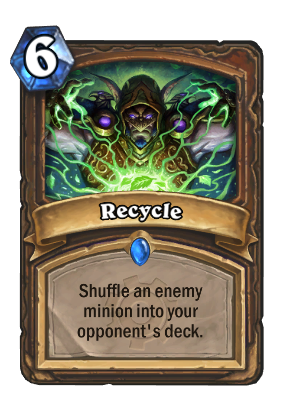 By recycle I think they mean disenchant for the dust ;) It's too expensive for what it does and since it's going to be played late game when decks are down chances are the removed card will be back soon. it's an expensive sap. It is not alqays the same, for example my opponent played Tirion in an arena match, if i wanted to kill it i had to trade my minions and removal spells and after that he would have got a 5/3 weapon, but i just recycled it and attacked the face!